Last week, my husband went for a hike up one of the nearby snow capped mountains, and stumbled across some beautiful porcini mushrooms. Because we seemed to have skipped straight from winter to fall, porcini mushrooms are just starting to pop up, and they are a very special find! Not being mushroom experts ourselves, we took them to several pharmacists and local mushroom gurus to make sure that they were, in fact, porcini mushrooms and not a toxic impersonator. Lucky for us, they were what we thought. We pondered what to make that would best showcase their delicious, earthy flavor and we easily settled upon risotto. 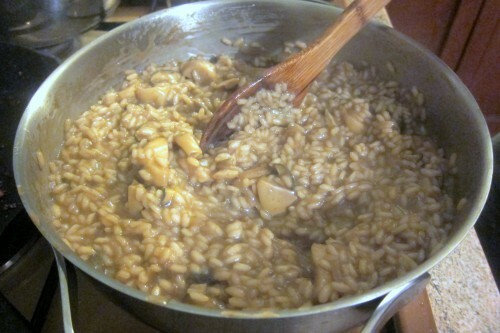 Risotto is wonderful. It is easy and inexpensive to make. 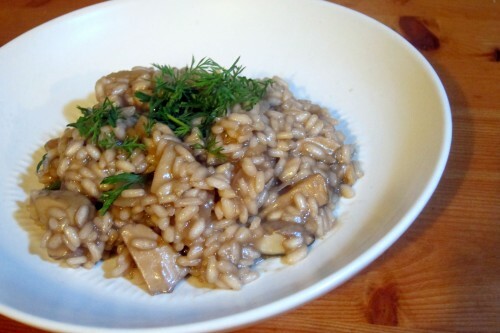 There are two schools of thought on risotto: those who stir, and those who don’t. My husband, who taught me to make risotto, is in the stirring camp. According to Gianluca, if you stir even a little bit you have to keep stirring until the risotto is done. 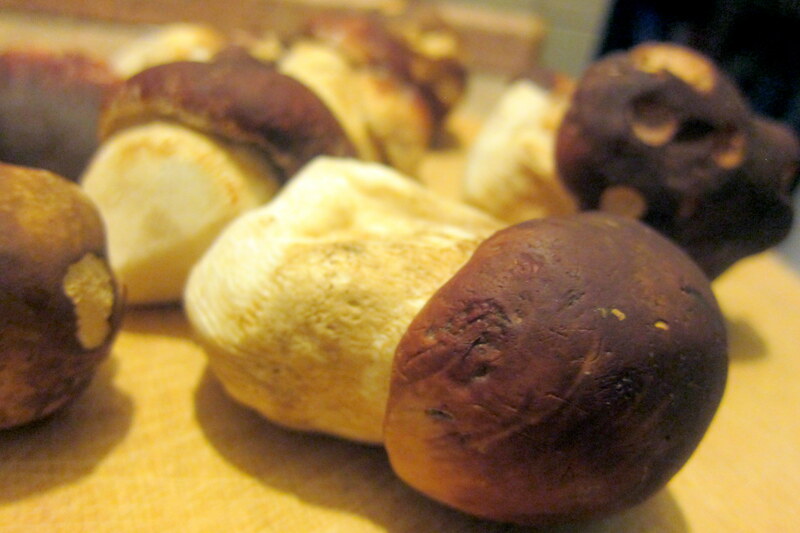 If you don’t have access to fresh porcini, you can use whatever mushrooms you have access to, or dried porcini mushrooms soaked in some water. 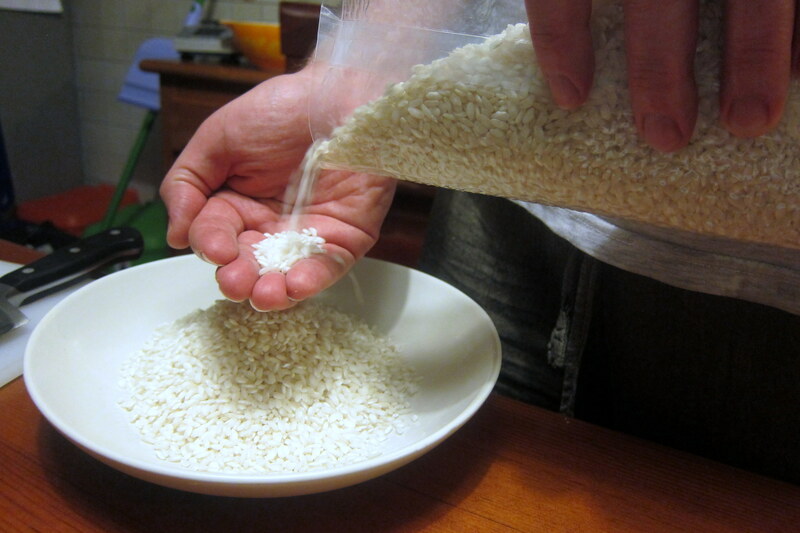 A good rule of thumb for measuring the amount of rice you need is to use 1 big handful per person, and 2 handfuls for the pot. That way you’ll have enough for a hungry crowd, or some leftovers. 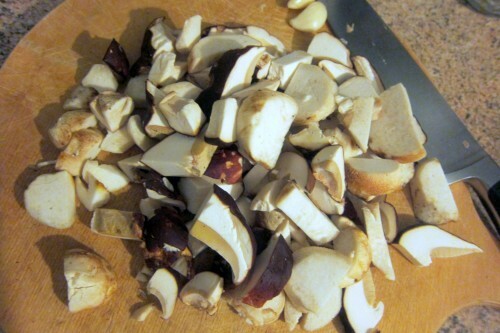 Slice your cleaned mushroom into chunky slices. It is best if you separate the stem from the cap and slice them separately. In a small pot, heat your broth and keep simmering on low. In a seasoned frying pan, heat 2 T olive oil with the crushed garlic cloves, until the garlic is fragrant and starts to become golden. Remove the garlic cloves. Keeping oil on medium heat, add sliced mushrooms. Add a splash of wine and a sprinkle of salt and cook on a low flame until mushrooms darken and the liquid mostly evaporates. This should take around 6 minutes. Turn off heat and set aside. In a low saucepan or large frying pan, heat the remaining 3 T olive oil and 1 T butter, and then add sliced onions and cook until softened. Add the rice and toast until fragrant, and then add a few glugs of wine. Using a ladle, add broth until the rice is well moistened and almost covered with liquid. Start stirring with a wooden spoon, and keep stirring until it is ready to serve. Whenever the risotto starts to dry out, add another ladle or two of broth. What he means is that you should stir gently; no vigorous stirring necessary. Stir the risotto like you are rocking a baby to sleep, or like you are sweetly seducing the risotto. Stir like a gentle caress. This is why Italian food is so good; Italians have a love affair with every meal they prepare. 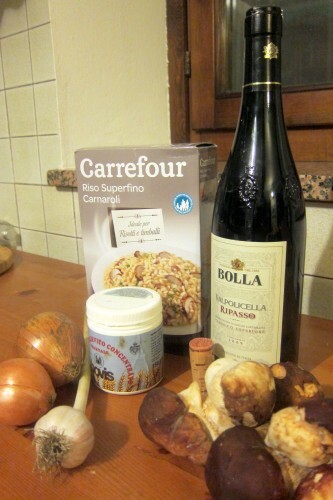 Anyways, after you are done seducing your dinner (lets say after 9-10 minutes), add the cooked porcini mushrooms. Cook until the risotto is ‘al dente’…. tender, but with some almost crunchy firmness, and salt to taste. Before stirring, you will want to do the ‘mantichetura’, which is to stir in a spoonful of butter. This creates a beautiful creamy texture! You can also stir in a handful or two of chopped parsley at this point. Serve hot in a flat bowl, top with freshly grated parmigiano and a drizzle of good olive oil! I never knew risotto was so romantic! Great writing, Annie. Many of them do, my husband went to a pharmacy (and then to a family friend who knows about mushrooms to double check) to confirm that they were porcinis. I think a lot of the younger pharmacists don’t know as much about mushrooms, or people know ‘theoretically’ but when faced with a real mushroom they aren’t certain. I was so surprised to find your blog! I come from Appalachia too (West Virginia), and while not as far up in the Alps as you, I’m pretty close — in Turin. I traded in the rolling hills of WV for the white-capped mountains here, and I love it. Anyway, so glad to have found your site! 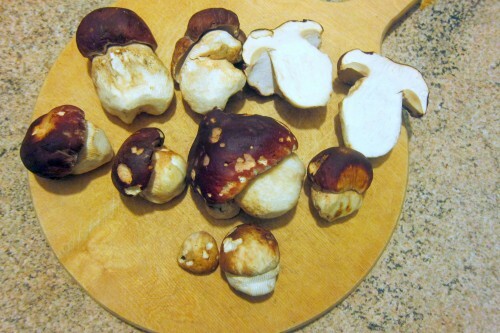 I bought some fresh porcini mushrooms at the market today and have to find a recipe that justifies their expense (lucky you for finding them!). Came across your risotto. 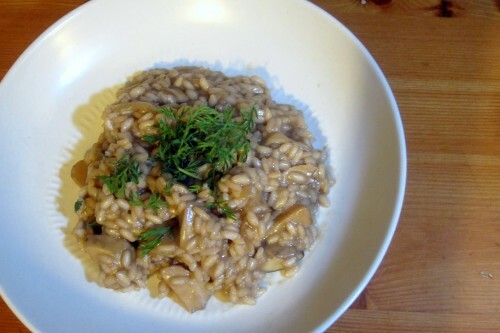 I went searching for porcini mushroom risotto recipes to cook for my boyfriend (who loves to cook, so I want to impress him), and am excited to try yours! I noticed you didn’t mention putting the crushed garlic back in once you remove it — is it sauteed just to add some flavor to the pan, or do you put it back in toward the end of the risotto? Hi! Sorry for the delay in response. No, you don’t put the garlic back in, it is just to flavor the oil. I usually just snack on it while I’m cooking the risotto, because it is delicious. Annie! I just made this for the second time, this time in an actual kitchen rather than a camp stove. And only for a few servings rather than 10. 🙂 planning to make it again for our next New Year’s Eve camping trip! Waiting for the next batch of Puccini to pop up in the area too.